PT Yodya Karya (Persero) - Yodya Karya or known as YOKA is a well-established state-owned engineering consultant company headquartered in Jakarta. Yodya Karya has core business focus on construction and non construction industry. Its business include consultant planner services, including architects, engineering and management consultant services. According to Yodya Karya's profile as cited by JobsCDC.com, Yodya Karya was first established in 1948 as a Dutch company named Naamloze Vennootschap Job en Sprey (NV Job & Sprey). In 1958, NV Job & Sprey was officially nationalized by the Government of Indonesia under the name of PN Yodya Karya. The name PT Yodya Karya (Persero) officially established in 1972. 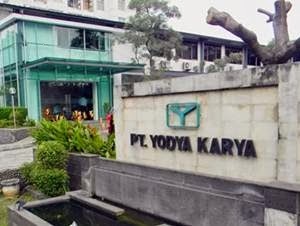 Yodya Karya is a State-Owned Enterprise (SOE) in the form of Limited Liability Company in which all shares are owned by the Republic of Indonesia. At present, Yodya Karya runs its business through 5 regional offices, 5 branch offices and also supported by 4 division units, namely Infrastructure Division, Engineering Division, Building Division, and Asset Development Division. Have an outstanding academic record with minimum of 3.00 for PTN and 3.25 for PTS. Minimum 1 year of experience in the related field. Fresh graduate will be considered. Placement in Medan (preferably domiciled in Medan). JobsCDC.com now available on android device. Download now on Google Play here. Please be aware of recruitment fraud. The entire stage of this selection process is free of charge. PT Yodya Karya (Persero) - Fresh Graduate, Experienced Staff Yodya Karya January 2018 will never ask for fees or upfront payments for any purposes during the recruitment process such as transportation and accommodation.